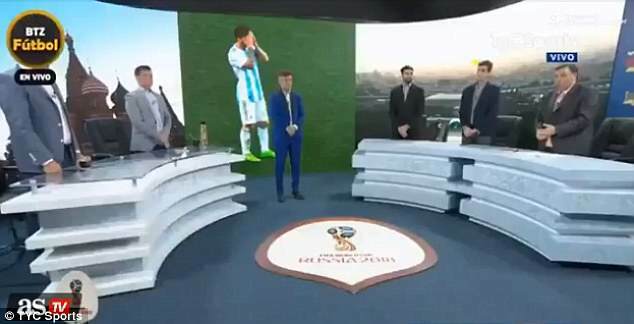 Some Argentinian TV hosts have done something quite stunning after Lionel Messi and his teammates suffered a shocking defeat to Croatia. The world was in shock over Argentina's defeat against Croatia on Thursday evening. In fact the whole thing seemed like a death knell for Argentina's World Cup hopes. If Iceland can beat Nigeria on Friday too, it will further damage their hopes of getting out of the group and reaching the last-16. Even so, presenters on Argentinian television may have gone a step too far with their post-match reaction. After Jorge Sampaoli's men fell to the shock 3-0 loss, unable to recover from a Willy Caballero mistake, they took the on-pitch funereal atmosphere into the TyC Sports studio. And with Argentina's hopes fading, they decided to hold a minute's silence to express their sadness. Lionel Messi and Argentina now need a minor miracle over their last game and Friday's fixtures to get out of the group.